A dental porcelain veneer is a thin customized shell made of colored materials that bond to the front of your teeth to help improve your smile. The shell is a bonded porcelain restoration of the tooth. When gross decay exist or a root canal has been performed porcelain veneers are not indicated. These veneers are professionally used by the Hollywood stars to solve problems such as stained, slightly crooked and poorly shaped teeth. 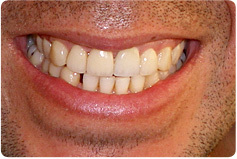 Porcelain veneers are also used to close gaps. Veneers are a dynamite way to blend bad teeth into a great smile and reduce the excess damage and enamel removal to the tooth. Dr. Sebastian is an expert in creating procelain veneers that are natural looking with customized translucency made to match identically to your existing healthy smile. George Washington wishes that porcelain veneers were available in his day. All you have to do is call and set up an appointment with Dr. Sebastian! To find more about porcelain veneers and the various prices please call our offices in Huntington Beach (714) 375-0959.